Your friendship and your concern for our work mean a great, great deal to us. This has been a remarkably challenging year for just about everyone, but thanks to you, our work has continued uninterrupted. Life has never been easy in western Alaska, and with high fuel prices that are frozen until next summer — up to $10 a gallon in some villages — our mission’s signal is one bright element, a beacon of faith and hope. Many times, we’ve been contacted by listeners who wanted to thank us for “holding them together” during difficult times. In turn, we thank you. As we reflect on the bumps in the road we’ve encountered during 2008, we thank you for keeping our signal strong, positive, helpful, and above all, inspirational. May your New Year be filled with many of God’s blessings. Thank you! FAMILY: (left) KNOM public affairs director Laureli Kinneen’s children Joe and Sidney love visiting the station after school. Here, they’re joined by Laureli’s husband Fen, who is a bush pilot for Nome-based Bering Air. Fen was available for the photo that day, as his charter flight to Provideniya, Russia, was delayed by weather. Both Laureli and Fen grew up listening to KNOM. AFFIRMING CULTURE: Among KNOM’s goals is helping to restore pride in Alaska Native cultures. Every hour, we play a traditional Eskimo, Athabascan Indian or Aleut song from our collection of 700, mostly recorded by KNOM staff. Weekly, we broadcast Eskimo Stories and Legends, from among 46 tales. Thank you for making this valuable service possible! FINANCIAL REPORT: This past year, you have rescued us time and again. Our late bishop, Michael Kaniecki, SJ, once remarked that it’s important for us to always remain a little hungry, so that we appreciate what we are given, and words do fail when we try to express our appreciation to you. We renew our pledge to you that we will continue to operate our mission as frugally as possible. Since we are more than 500 miles from the nearest highway, all supplies are brought to Nome by oceangoing barge during the brief summer, and by air the rest of the year. Thus, the high cost of energy affects the cost of everything in Nome. The electric bill for our 25,000 Watt transmitter is 65% higher than it was just three years ago. The cost of heating our studio has nearly doubled in that time. 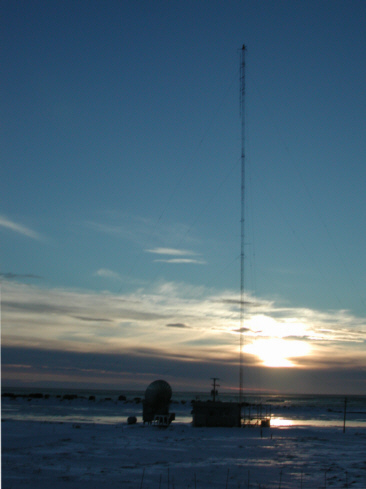 (Left) The KNOM AM transmitter site at high noon on the shortest day of the year, 2000. While energy prices are lowering in most of the United States, Nome’s gasoline is stuck at $4.99 and heating oil/diesel fuel stands at $5.49. Those are the prices established at the time of the summer’s last delivery. Meanwhile, if you’ve followed us over this past year, you’ll recall that we suffered several unexpected financial hits. Every time, you pulled us through, and throughout, our signal of education, information, news and especially inspiration has remained solid and strong. Thank you! Our total expenses for the year ending June 30 were $1,452,449. In these uncertain financial times, our income was less than that, $1,227,436, and we dug into emergency savings to cover the rest. Thanks to you, we had those savings, which allowed us to continue our service. 98.1% of our income was from individual gifts by good people like you. If you would like a detailed spreadsheet of our finances, we welcome you to contact business manager Lynette Schmidt, who would be happy to mail or e-mail you a copy. 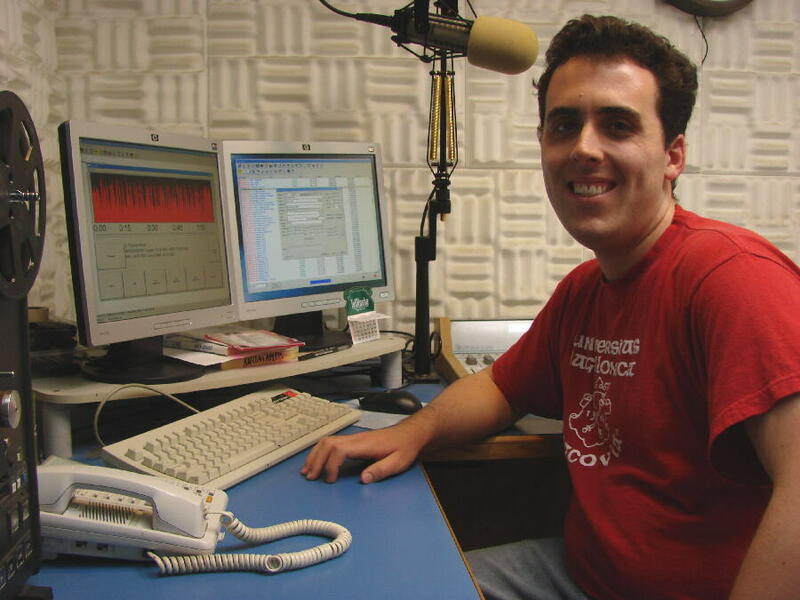 KNOM PRIMER: We are the oldest Catholic radio station in the U. S., on the air July 14, 1971. We are wholly owned by the Catholic Diocese of Fairbanks. Our signal blankets 100,000 square miles, roughly the size of Vermont, New Hampshire, Massachusetts, Rhode Island, Connecticut, New York State and Pennsylvania combined. Although we are listened to as far as a thousand miles away, into northern Canada and deep into eastern Russia, our primary service is to Alaska Native villages. 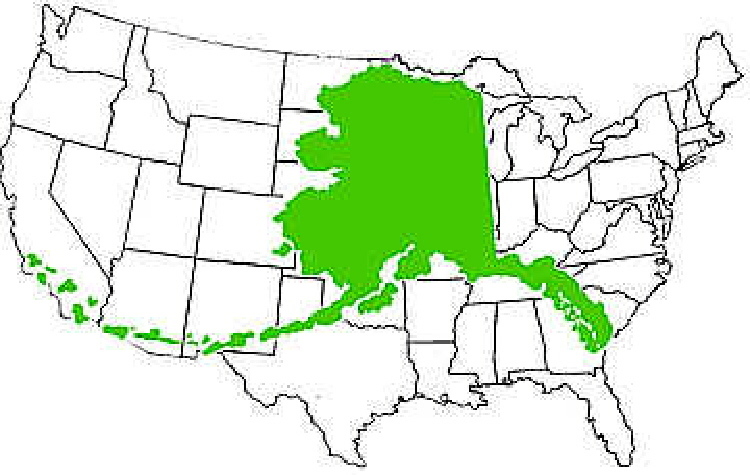 (Left) This image, from the State of Alaska, illustrates the state's size relative to the Lower 48. Our signal is immensely popular, almost certainly the most popular of any religious station in the country, ranging from 76% to 100% of adults listening every day, depending on the village. We provide many varied services. In many of KNOM’s villages, if you are Catholic, your only option for ever participating in a Sunday Mass is praying along with the Mass broadcast by KNOM. Other villages may see a priest once a month, once every two months, or once a year. In some villages, parishioners gather in their church and pray with the radio broadcast. (Left) In this photo taken in 1998, then pastor Fr. John Hinsvark celebrates the Sacrifice of the Eucharist in Nome's St. Joseph Parish. 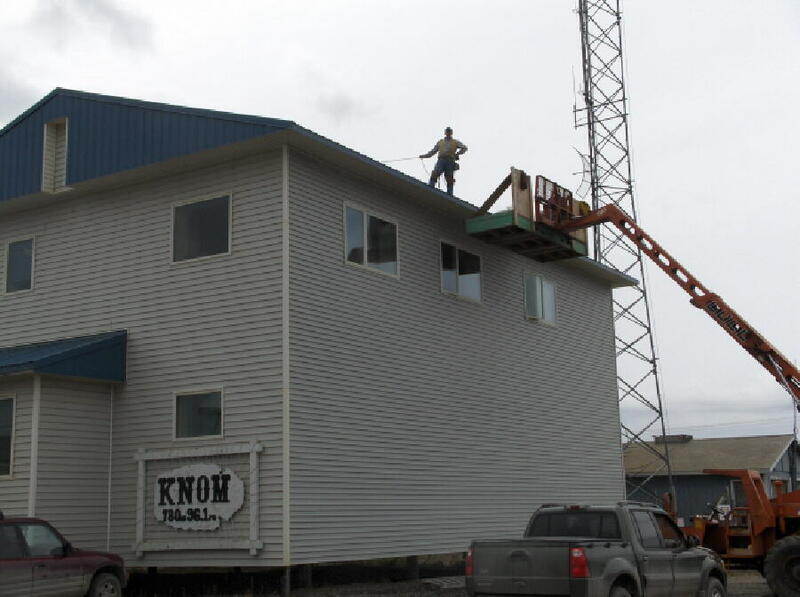 Our news crew is the largest radio news department in bush Alaska. Hourly, we broadcast weather forecasts for eight forecast areas. For people contemplating travel by snowmobile or boat in this road-less region, this is their only means of obtaining weather information by which they choose whether or not it is safe for their families to travel. We provide news, inspiration, education and positive companionship 24 hours a day. Throughout the course of 2008, we broadcast 34,000 educational spots and 34,000 inspiration spots. Thank you for making this extraordinary service possible! INSPIRATIONAL SPOT: To be upset over what we do not have is to waste what we do have. As power fails, over KNOM, Nome police chief Paul Burke urges everyone to stay where they are. After the storm passes, temperatures drop to the low minus twenties. General manager Ric Schmidt is out of state and Tom Busch cashes in airline miles to make sure the transmitter site’s generator is okay — it keeps KNOM on the air for more than five days. 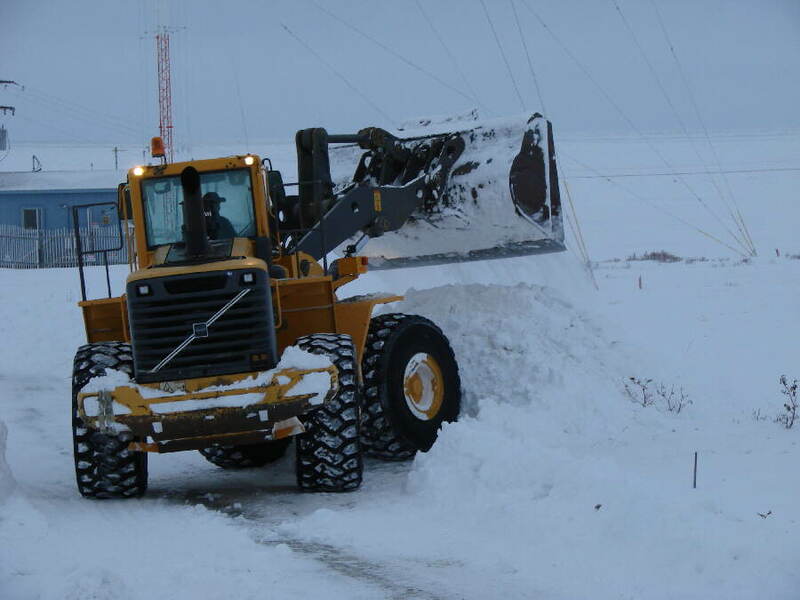 (Left) A front end loader clears snow from the site's 400-foot driveway, and the generator's fuel tank is filled. February: Late in the month, KNOM discovers that the firm which prints and mails the Nome Static has failed to do so since December. The outfit mails the first two newsletters of the year via First Class Mail, one and two months late, at their expense. 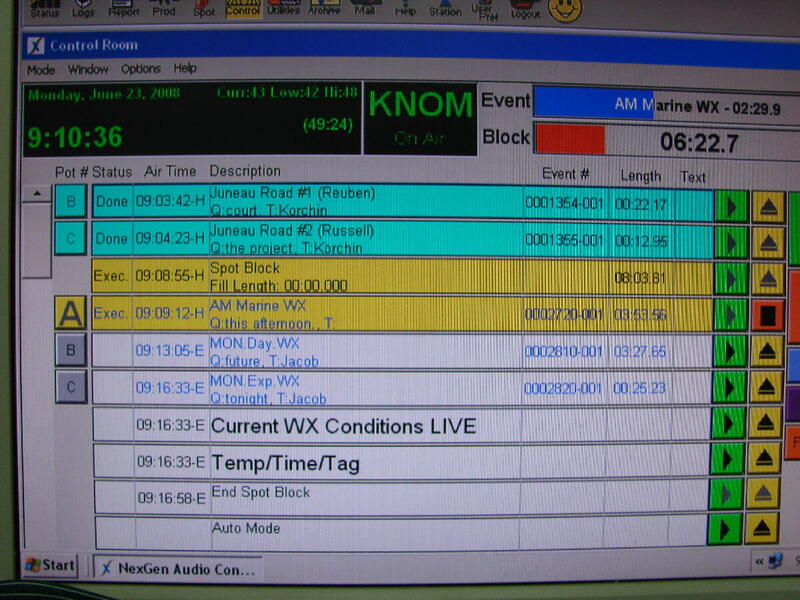 With temperatures at –30�, the KNOM studio’s furnace repeatedly fails. At one point, the temperature inside the studios drops to within twenty degrees of freezing. This month, the station produces and airs a two-hour program, highlighting the area’s largest Alaska Native dance festival, filled with traditional music and stories of the songs’ origins. March: Nome police request an unusual announcement, asking people to stay away from the north side of the city’s hospital (left), where a moose and her calf have taken up residence, probably to take a break from slogging through deep snow. 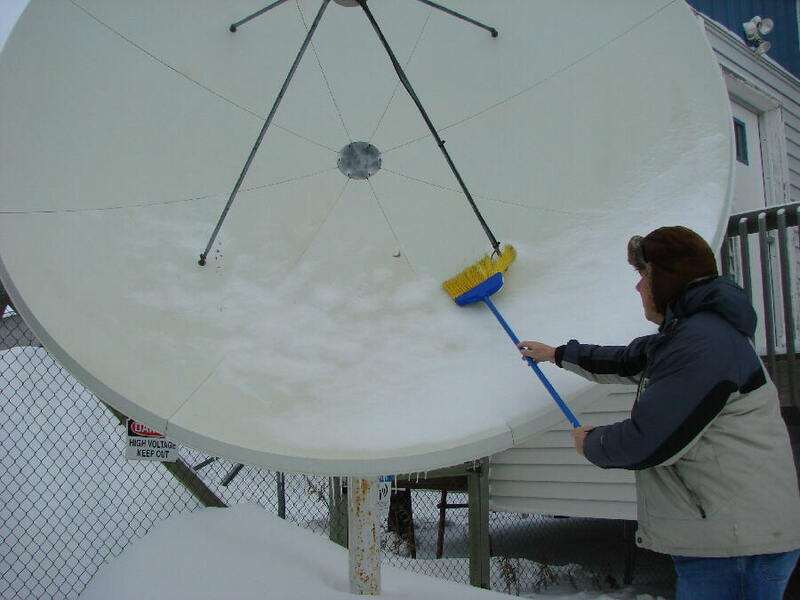 Drifts in places are eight and ten feet deep, and it’s a several-times-a-day job for Ric Schmidt to dust off the mission’s satellite dishes (left). This month, after about 5,000 loads of laundry, the volunteer house clothes washer fails, as volunteer Laura Davis demonstrates (left). We offer special thanks to the couple who contributed $500 for its replacement. April: Former chief engineer Les Brown, who now lives in urban Alaska, flies to Nome for two weeks to ensure everything technical is ship-shape. Les’ departure is delayed by two days of blizzard; the same week, a second blizzard pins down Tom Busch for a day. 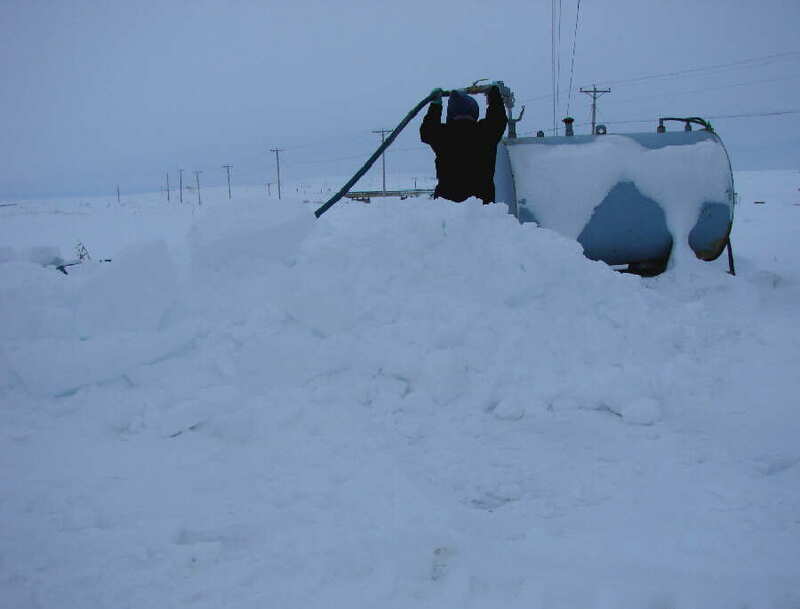 (Left) An April 2008 blizzard shuts down the town of Nome. May: There’s more critter news. With reindeer fawning just north of Nome, people are cautioned to avoid them, as the moms are strongly protective of their babies. May and June: As every year, for 100,000 square miles, ears are especially glued to KNOM for river conditions and forecasts, as the station broadcasts timely news about ice buildups and potential danger spots for spring flooding. 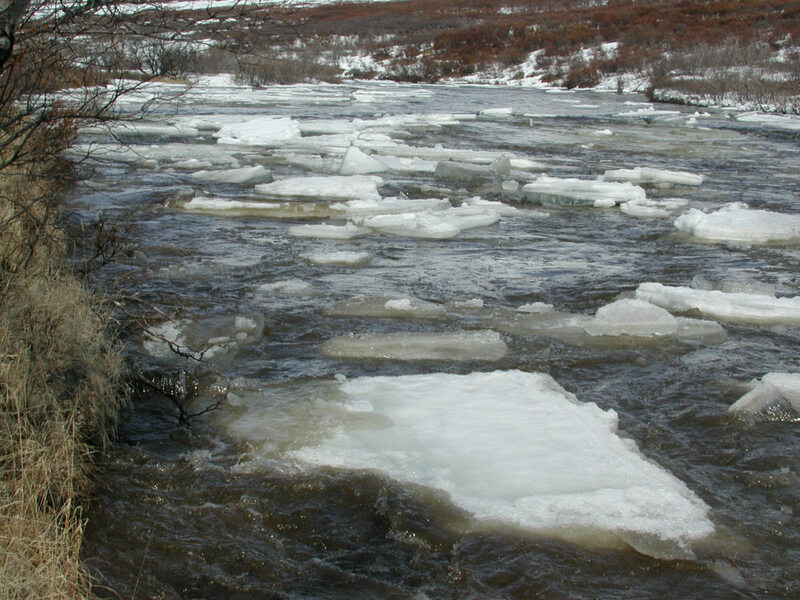 (Left) When melting ice jams on the tiny Nome River, there's little threat, except for a few cabins. Along the mighty Yukon River, flooding can paralyze entire villages. June: Dense fog shuts down the Nome airport for over seven days, forcing 28 consecutive Alaska Airlines flights from Anchorage to overfly the town. Outgoing volunteer Kristina Proctor’s homecoming is delayed by five days. 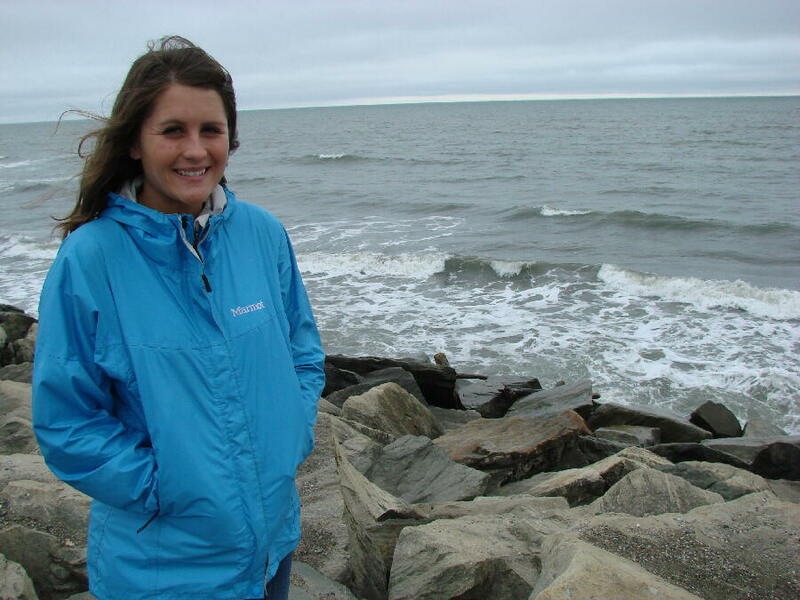 The weather also prevents program director Kelly Brabec from attending her sister’s wedding. 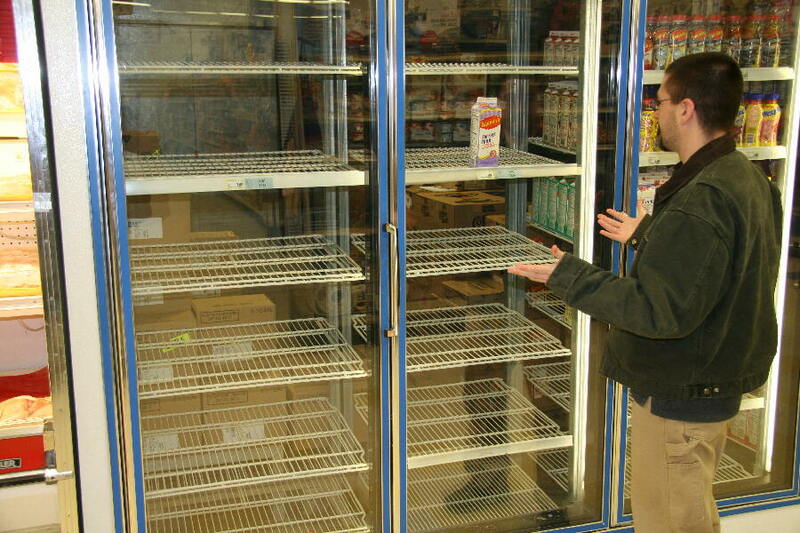 (Left) Since all of Nome’s groceries arrive by air, store shelves like this milk cooler are empty until the weather clears, as volunteer Jacob Buckenmeyer notes. June 1: The ten computers which control KNOM’s audio are old at the age of six. Today, the system irreparably fails. Its replacement is a sudden unexpected cost of $59,396. (Left) One of the screens of the computer which takes care of master control Studio A.
July: Volunteer Dave Dodman (left) signs up for a third year of full time unpaid service to the mission. It’s a typical month: On the air, you would hear discussions on topics such as law enforcement in the Alaska bush, the difficulty for rural residents to obtain drivers licenses and IDs, and many more. Meanwhile (left) work begins on a major repair to the studio building’s metal roof. Over the years, the brutal Nome wind has loosened most of its sheet metal screws. Ace repairman Dan Scholten performs the work. August: Periods of dense fog continue to plague Nome. Many flights from Anchorage overfly the town, and mail is delayed one to two weeks. September: After more than six years of service to the mission, Amy Flaherty (left, by the chilly summer Bering Sea) departs Nome for urban Alaska. 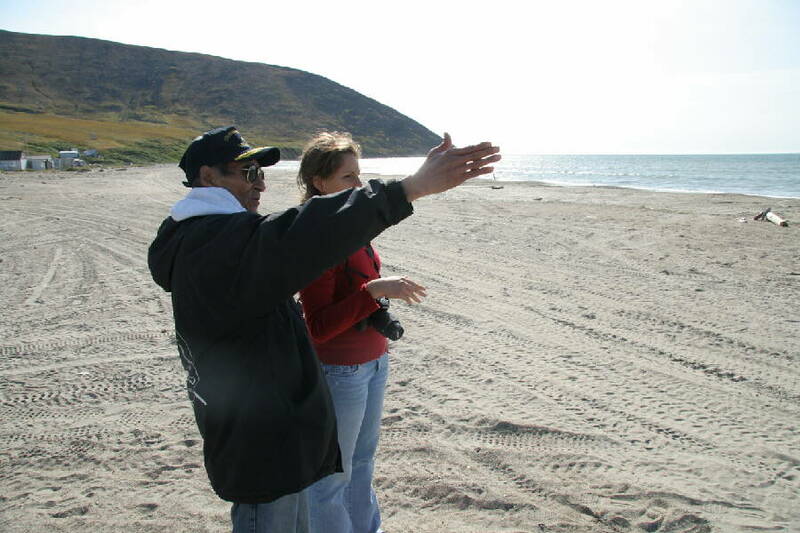 Throughout her KNOM career, she has produced hundreds of interesting interviews, educational and news programs, with a particular interest in Alaska Native themes. (Left) She’s been in Alaska less than a week, but already, volunteer Danielle Sylvester is hard at work. On the western tip of Alaska, the mayor of Little Diomede points to his island in the Bering Strait for Danielle, who has flown to the tiny village of Wales to cover a Native dance festival. 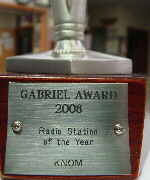 October: (left) KNOM receives the Gabriel Radio Station of the Year Award, among the top broadcasting honors in the United States. 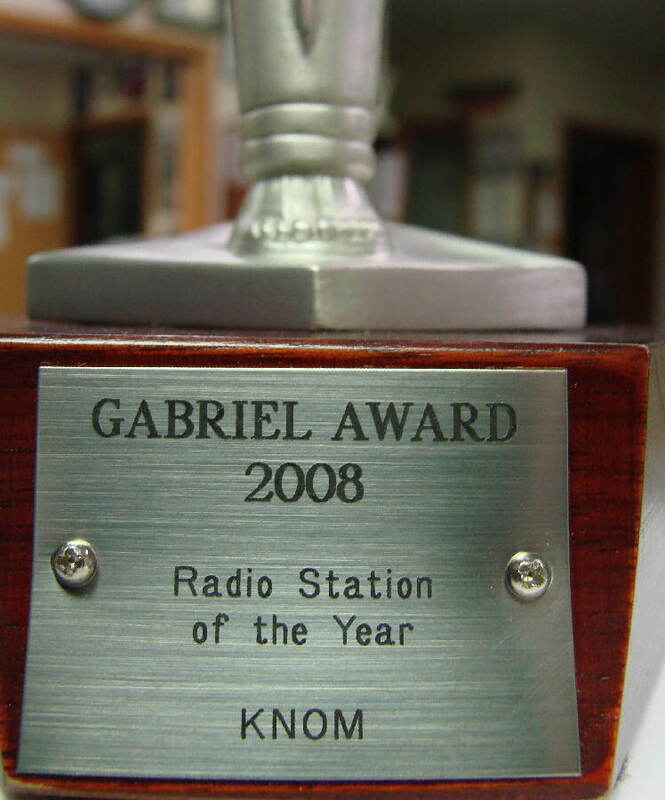 Interestingly, KNOM is the only small-town station and the only Catholic station, to be so honored. It is KNOM’s 17th top Gabriel, and its 13th in a row. November: The Alaska Broadcasters Association honors KNOM for Best Public Affairs Program and Best Coverage of Breaking News. November 26: Nome sees its first blizzard of the winter. Thanksgiving dawns snowy and -10�. November 30: Bishop Donald Kettler confirms 12 teens in Nome’s St. Joseph Parish, during a Mass broadcast by KNOM. 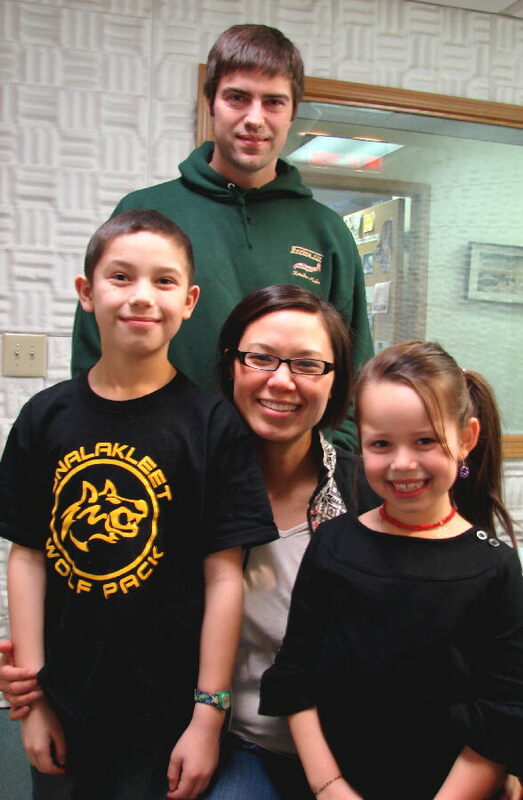 Four of the youth are offspring of parents who first came to Nome as KNOM volunteers. Their teacher is former KNOM volunteer Linda Peters, RN. Thank you again, most sincerely for your assistance in keeping our mission work alive. We offer to you our deep gratitude for your generous help and your prayers. We offer our own prayers that the New Year for you and those you love will be greatly blessed. Copyright © 2008KNOM. All rights reserved.